The popularity of electrical engineering courses in 1904, coupled with the demand for programs in engineering fields other than electrical, led to the creation of the School of Engineering in 1906. Residents of New Mexico wishing to study engineering in 1907 received free tuition. Nonresidents paid $10 a semester. Room and board totaled a mere $20 a month. Between 1904 and 1917, the department evolved from a two semester course of instruction to a four-year undergraduate degree-granting program. In addition to the annual tug-of-war, students in the Colleges of Engineering and Arts & Sciences challenged one another in highly publicized basketball games, road races and even swim meets throughout the 1920's and 1930's. In 1944, Mrs. Pid Urquhart received her BS in electrical engineering making her the first female graduate of the Department of Electrical Engineering. In 1956, the Electrical Engineering Department began a Doctor of Science degree-granting program. The department took on the current name of Electrical & Computer Engineering in 1979. In 1986, construction was completed on the new ECE building. Officials used a laser for the ribbon-cutting ceremony. The building houses research labs for such things as robotics, hearing aid research and artificial intelligence. The Centennial Science and Engineering library is also located in part of the 2-story underground portion of the building. In 1995, several ECE professors received teaching awards, a testament to the emphasis on teaching in the department. 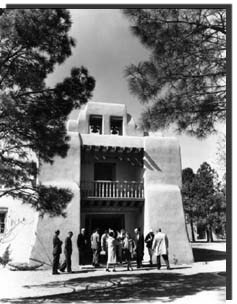 Today, the ECE department continues to command nationwide recognition and respect--a direct result of over ninety years of history on the University of New Mexico campus.